Visit the impressive Amazon rainforests on Panther Queen Slot at Wicked Jackpots! Powered by Pragmatic Play, it consists of 5 to 6 reels and 25 paylines. Enjoy the exceptional and peaceful atmosphere as you wander among the tall trees. Admire the animated green backdrop on which you can see a beautiful waterfall and lots of greeneries. The reels are also in green and contain the following symbols: Puffin, Monkey, Panther, Red Flower, Snake, A, K, Q, J and 10. 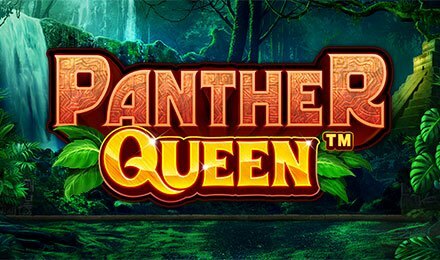 Join the gorgeous Panther Queen and enjoy this game on any type of device! Place your bet on Panther Queen Slot by selecting one of the amounts on the Coin Value field. After all your preferences are defined, press the Spin button to set the reels in action. Don’t miss the Auto Play feature as it allows you to enjoy a set number of rounds that are automatically played. You can also stop it anytime during your gameplay. Bet Levels: One to 10 coins are available per line. Amount of Paylines Selection: The 25 lines stay active during all spins. Coin Values: Make use of the following coin denominators: 0.01, 0.03, 0.05, 0.10, 0.20 and 0.50. On the right-hand of the screen on Panther Queen Slot, you can find a 6th reel which is also known as the Multiplier Reel. It contains different win multipliers, such as 1x, 2x, 4x, 8x or 10x. This additional reel spins together with the others. The multiplier value on which it lands is then applied to the wins. The Panther Queen icon stands for Wild and replaces all other symbols to complete winning combinations. When it shows up in the middle row, it covers the entire reel and creates more possibilities for a massive win. On Panther Queen Slot, the Free Games are triggered when the Temple icon is displayed in the frame on the Multiplier Reel. Five free spins are then awarded. During this feature, the reels 2, 3 and 4 land on a Giant 3×3 symbol. Receive 5 additional free spins every time the Temple symbol appears during the round. An unlimited number of free spins can thus be triggered! Catch a glimpse of the beautiful Panther Queen as you enjoy Panther Queen Slot at Wicked Jackpots. Dive into the wilderness and have lots of fun. Good luck!